Last month Tony Juarez wrote a piece called Fantasy and Femininity, reviewing a children's book named Young Ladies Don't Slay Dragons. It's a good post, one in which Juarez challenges fantasy writers to "counteract [virulent cultural feminism] with a view of femininity that highlights what St. John Paul II called in Mulieris Dignitatem the "feminine genius."" In his opinion, female characters in Catholic writings can offer a "sincere gift of self in a heroic manner", and I agree. But I felt his analysis missed something very important - something that occurred to me this morning, on this great Solemnity of the Immaculate Conception. Young ladies may or may not exactly slay dragons, but they sure as heck fight them! And this isn't a virulent feminist ideal (although the thought can be taken in several stupid directions), but is a universal truth within the Catholic Church. The devil despises The Woman - and all women - but especially those who "bear testimony to Jesus." The passage from the book of Revelation doesn't apply just to the Blessed Mother and her son Jesus, but to all women. You. Me. Our next-door neighbour. Everyone of us have a battle to fight against evil. I have grown up with images of Mary that characterize her is demure, quiet, meek, reserved - even when she is pictured crushing the head of the serpent with her heel, she still seems peaceful and serene. And I can only imagine that she was all these things. But pigeonholing her whole being into only those traits is a big mistake. It has made me forget that she fights evil - and not just any old evil, but THE dragon of dragons evil, Satan himself. He attacks, she takes to the wings of the great eagle. He pours out water, the earth protects her. What courage to even stand in the face of such evil! What a fearsome woman! This may not be the type of battle that we're used to where swords meet and arrows fly (war scenes from Braveheart and the Lord of the Rings come to mind), but they are battles nonetheless. And just as scary as you can imagine. Makes me think. 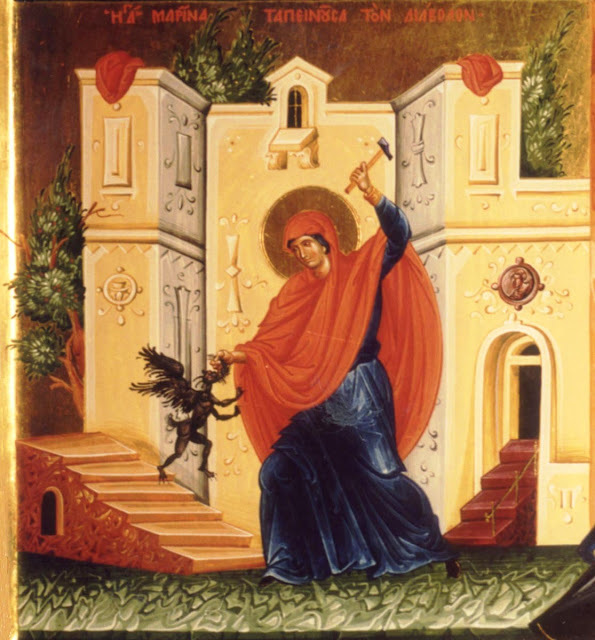 Perhaps the "sword" that Mary uses against the Great Dragon is her meekness? Her humility and great love? Perhaps the devil hates those virtues and every other one she possesses more than he could ever hate steel and arrow - so intensely that he flees from her company. Her foot touches his head and burns him through with righteousness and truth. Maybe that's why she is portrayed with such serenity while the devil languishes at her feet? And perhaps, by extension, all women can fight the great evil in their lives with the same manner of weapons. Whatever wounds there are in your life, we can always put on the "breastplate of righteousness, having shod [our] feet with the equipment of the gospel of peace; above all taking the shield of faith, with which [we] can quench all the flaming darts of the evil one. And take the helmet of salvation, and the sword of the Spirit, which is the word of God. Pray at all times in the Spirit, with all prayer and supplication." So go to it, Warrior Princesses, offspring of The Woman! Fight to the death. *sigh* This has been a long-running struggle for me, and one of the main reasons I feel so very un-Mary-like: I have not figured out how to be meek. Thanks for this reminder and the encouragement.